Last year I threw a girls' night that was a Valentine-making party, and it was such a fun evening. Single, attached, younger, older, everyone has someone who would appreciate their handmade Valentine. We gathered at a friend’s art studio, but it would be just as easy to put together at home. Even grown adults get giddy around glitter and glue. I invited a wide range of girlfriends to my Valentine-making party. We had the space, and I’ve found that nights with an activity are a great way to get to know new friends better. 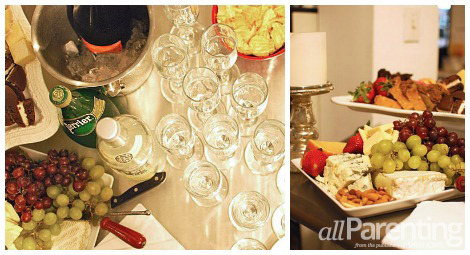 Our party was in the evening, so we had light appetizers and finger foods and plenty of wine and Champagne. A surprising number of people can be a little uptight about the artistic process, so a glass of bubbly loosens up the creative juices. There were all sorts of craft supplies available. The usual suspects: sequins and construction paper and doilies. The advanced levels: pipe cleaners and a glue gun, dried leaves, buttons and feathers... even a typewriter. There were no rules, no judgement. It was fun to watch the women help and encourage one another with their ideas. Everyone had a different Valentine style, and this just fueled the excitement. Some of my guests dove right in to their projects, and others were a little shy. 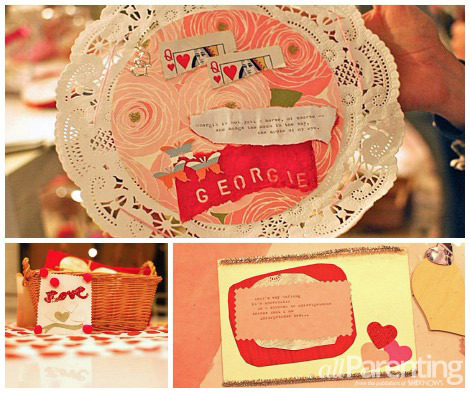 But soon we were all working diligently at the table, chatting a little but also immersed in our personal Valentines. I was impressed with the women who managed to get a handful of little greetings completed. 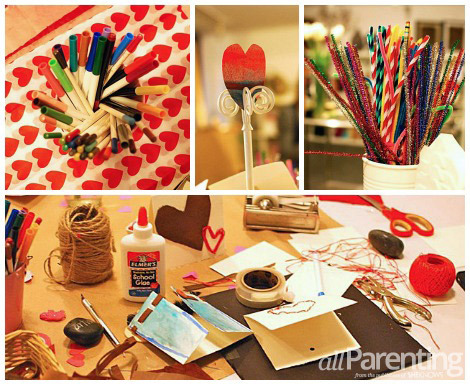 They made Valentines for their children, their moms, their pets, their cubicle partner. Some were romantic, many were silly. All of them were beautiful. My guests were grown women, some of whom considered themselves creative types, but several who did not. But there was a unifying buzz in the room that came from more than just the Champagne. Working with our fingers, tediously applying a row of sequins or brushing on a layer of Mod Podge, we tapped into something we often lose in adulthood. We felt like kids again, caring less about the final product and just enjoying the process. The Valentine-making party was a huge success. It combined everything I love about entertaining: friends, laughter, an activity and a purpose. I hope to make it an annual event every February.